Tuscan olive oil, Tuscan bread, focaccia with grapes, funghi porcini, truffles, Tuscan saffron, bistecca alla fiorentina, porchetta, Tuscan prosciutto, pecorino. Italian cookery is well-known in every corner of the world, and Tuscan gastronomy in particular is one of the major pleasures that brings visitors to its source right here in Tuscany. Although every province of Tuscany has its own cuisine, often with highly distinctive specialties, the vast majority of Tuscan dishes are characterised by simplicity in preparation, so that the flavours, aromas and textures of the basic local ingredients are clearly discernable, despite infinitely varied flavour and presentation. 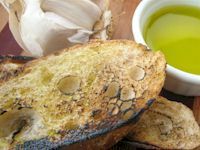 Tuscan dishes frequently depend heavily on olive oil and bread, and are rich in legumes, fresh vegatables, herbs and fruit, plus far more meat, including game in season, and much less pasta than would be anticipated in a "Meditarranean diet". Fish and other sea foods play a role in coastal areas but less so inland. And of course, as in other wine producing parts of the world, Tuscan wines seem to have evolved to match the flavours of local dishes. Olive oil (olio di oliva) plays an extremely important role in Tuscan cuisine, replacing butter in almost all cooking and forming the most important condiment for a huge range of cooked and uncooked dishes. Not surprisingly therefore, the cultivated areas of Tuscany are dominated by olive groves and, since much of the olive harvest is carried out by hand, a significant part of the rural population has a hand in olive oil production. A visit to Tuscany provides an excellent opportunity to familiarise yourself with genuine Tuscan extra virgin olive oil and to buy a few bottles to take home. You can be sure that you're tasting the real thing by buying directly from a producer and/or looking for the green DOP guarantee label on the bottle. Almost every wine producer also harvests olives so that the olive oil sold at wine degustazione points everywhere in the Region is almost certainly the real thing. More about Tuscan extra virgin olive oil. Bread (pane) is still extremely important to the Tuscan diet, especially for that part of the population living in villages and in the country. Tuscan bread is also often misunderstood by visitors to Tuscany, for two reasons: it lacks salt and it goes hard very quickly. This means that, unless cooked the same morning, traditional Tuscan bread will not make a good breakfast. The role of bread in Tuscany is as an accompaniment to main courses (secondi) as well as to the numerous salty hams, salumi etc. eaten here as starters (primi piatti). Tuscan bread also forms the basis for many very popular dishes that originated among farmers (contadini) as a way to make good use of dry bread (e.g. bruschetta, crostini, ribollita, panzanella), very often in combination with olive oil. More about Tuscan bread. Schiacciata means "flattened down or squashed" and in Tuscany the term generally refers to flatbread, also called focaccia, especially in other parts of Italy. Schiacciata or schiacciatina is usually prepared salty and eaten in the morning or for lunch filled like a sandwich, and whenever a salty snack is called for. 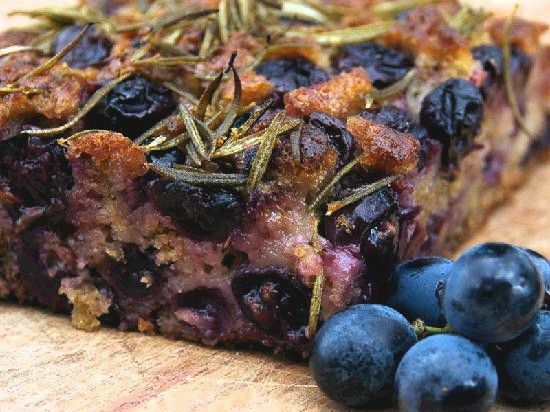 However, during the vendemmia (grape harvest) in September, Tuscans make schiacciata con l'uva, a non-salty, not-too-sweet dessert of bread dough and wine grapes, not sweet seedless table grapes. This simple country bread is delicious and, of course, highly variable. It's therefore important to try various recipes or bakeries, and when you find the one you like, stick with it. Your webmaster strongly prefers schiacciata con l'uva that contains very dark wine grapes, a lot of rosemary and, above all, a lot of crushed walnuts, plus a good sprinkling of sugar on top. As in most Tuscan dishes, there is olive oil both in the dough and in the pan during baking. Vivere la Toscana offers one of the best high quality Tuscan product lines on the internet. Not only do they offer the best of hard-to-get Tuscany culinary specialities, but they offer a selection of Tuscan fashion accessories, leather bags, shoes and handicrafts. For the best quality, excellent pricing and reliable, personal service, try Vivere la Toscana. Porcini mushrooms are commonly referred to simply as porcini although there are numerous local names arising from the polymorphic nature of the species and the presence of some closely related edible mushroom species in Tuscany. Porcini are usually found in spring and again in late autumn, especially after rainfall, and are much sought after on account of their delicious nutty flavour and satisfying texture. Perhaps surprisingly, porcini also have significant nutritional value. If you collect your own porcini, or at least buy fresh ones, then you'll be sure about what you're getting. This is important because real porcini are delicious and can be eaten in a huge range of dishes, but commercial dried porcini, especially if they originate in China, are commonly adulterated with a mushroom species of similar appearance, Tylopilus felleus, which is very bitter and unpalatable. 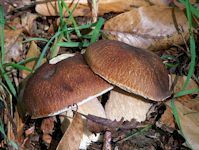 More about porcini mushrooms. Truffles (tartuffi) of the correct species and appropriate freshness add an amazing aroma to certain dishes. Truffles of the wrong species or more than a few days old have no more flavour nor aroma than cardboard - less probably. And in addition, truffles are now very expensive. It's therefore important to buy your truffles from a reputable source (best of all, directly from the truffle hunter) and to consume them within four days after they were dug up. One of the best ways to obtain truffles and/or sample traditional truffle-flavoured dishes is to attend a truffle fair, of which there are several held in Tuscany during the truffle seasons. Truffle fairs are held in and around San Miniato during March and again during September, October and November and in San Giovanni d'Asso during November. More about the white truffles of San Miniato and Tuscany. More about the truffles of Norcia and the Norcia Truffle Fair. More about the various types of Italian truffle. Many visitors to Tuscany are surprised to discover that saffron is grown here. In fact, for several centuries in the later middle ages, saffron was the "red gold" of San Gimignano and other areas of Tuscany, rivalling silk cloth production in profitability. Saffron is currently grown in Tuscany in small quantities but of very high quality. Some of the saffron production is used in saffron-flavoured biscotti and pasta sold locally, some is exported northwards to Piemonte for use in risotto alla milanese, and Tuscan saffron is available for sale, often directly from the growers, in both thread and powdered form. Threads are to be preferred. Saffron prices in Tuscany are comparable with commercial rates elsewhere but one reason to buy your saffron in Tuscany is because in other places saffron adulteration is commonplace. More about Tuscan saffron. Tuscan beefsteak or, more correctly, Florentine beefsteak, is one of the high points of Tuscan cuisine . . . if prepared properly. The steak traditionally comes from a two year old Chianina ox although demand outstrips supply so that Spanish beef is often used. The cut is essentially a T-bone and the steak is grilled rapidly over charcoal so that the outside is well-done while the interior is rare. Olive oil, pepper and even lemon juice may be added to the cooked steak. The cooked bistecca is cut off the bone and into strips which are served on a plate that is shared. Hence in restaurants there is usually some preliminary discussion on the size of steak required for your particular group. The traditional accompaniment is a bowl of Tuscan white beans (cannellini). More about how to select, cook and serve a bistecca alla fiorentina. Porchetta comes in a number of forms but the most popular is sliced off a pig that has been roasted entire over a wood fire. The liver is left inside the animal and all the cavities are stuffed with a mixture of rosemary, whole garlic cloves, fennel seeds and salt. Cooking over a wood fire takes about five hours. A well-done animal has a crisp layer of crackling on the outside. Porchetta is available at weekly markets and at fairs, as well as in norcerie (specialised butcher's shops named after the Umbrian town of Norcia which is famous for its pork products) and, from time to time, in supermarkets. Supermarket porchetta is bought by weight (specified in "etti" - 100 gm) and eaten with Tuscan bread (saltless bread). You normally pay only for the meat and afterwards you ask for garlic, liver and crackling to taste. In contrast, at open air markets and fairs, porchetta is additionally sold as a thick sandwich prepared according to your instructions. More about Tuscan porchetta. Prosciutto is a dry-cured ham that is usually sliced thinly and served uncooked, hence prosciutto crudo, in contrast to cooked ham, prosciutto cotto, which is similar to ham as it is commonly known in many other countries. Prosciutto crudo is by far the more popular type of ham in Tuscany and most other parts of Italy. The most famous prosciutto comes from Parma and is referred to by Tuscans as "dolce" (sweet), in contrast to Tuscan prosciutto which is salty. Parma ham should be sliced extremely finely and melt in the mouth while Tuscan prosciutto is often hacked off the ham with a knife and is somewhat chewy. Parma ham is often eaten accompanied by a slice of melon or similar fruit and some mozzarella. Tuscan prosciutto is more often eaten with Tuscan bread which is characteristically saltless. More about Tuscan prosciutto. When Italy was unified during the mid 19th century, the Tuscan dialect spoken in Florence, the language of Dante, was chosen as the national language. Tuscan, of course, has a word for cow's milk cheese, namely formaggio. However, if you are dining among Tuscans and you are offered "formaggio", this will invariably be a reference to Parmesan cheese (parmiggiano) which originates in Parma in the Region of Emilia-Romana, to the north and nroth east of Tuscany. This is because parmiggiano is the only cow's milk cheese commonly eaten in Tuscany, usually grated onto pasta. 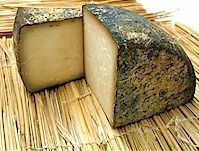 The cheese of Tuscany is pecorino, ewe's milk chese (sheep's milk cheese - sheep are pecore), characteristically sharper in flavour so that it is often eaten with honey. The varieties of pecorino differ based on how much they have been aged and where they come from. Aged pecorino is not better than fresh pecorino - it's purely a matter of individual taste. Some like a soft percorino, others prefer a hard pecorino eaten in wafer-thin slices. Similarly, each person has his preference in terms of origin. Some say the pecorino of Sardinia has the flavour of the mountain herbs the sheep feed on, while many claim that the pecorino of Pienza is the best in Tuscany. More about Tuscan percorino cheese. For more insight into the unique raw materials of Tuscan gastronomy: Slow food of Tuscany and Umbria. Some useful links for Tuscan food and wine fans! A Tuscan salumi selection as antipasto. Wine making using terracotta jars. Porcini mushrooms in Chianti, Italy. Schiacciata con l’uva Tuscan grape bread. Porchetta – Tuscan roast whole pig. 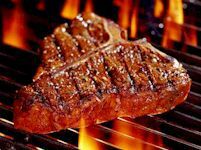 Bistecca alla Fiorentina, the grilled steak of Tuscany. Dario Cecchini, butcher and showman at Panzano in Chianti. A Chianti Wine Tasting Tour.